Modesty Blaise formed in early 1994 and rapidly recorded their topjuke-box hit single Christina Terrace with Edwyn Collins at the helm. It was an instant success, the video was played on ITV and the single appeared near the top of many end-of-year polls. This acclaim however was not enough to quell the kind of internecine warfare that Modesty Blaise have become famous for. Six months after the first single, a new line up released the West-Country Soul ballad You Can Do Better Than That which also sold rapidly and an ITV company decided to make a documentary about songwriter Jonny Collins. However, between filming and broadcast, another two band members had come and gone. By the time the 'Blaise recorded The Most Beautiful as the third single for Spirit of '86 Records only Jonny and Dave remained from the original line-up. It was at this point that the 'Blaise turned up to do a BBC Radio session with seventeen people. After the ensuing technical difficulties a huge fight broke out at a curry house which put paid to another line-up. More new members came, and a disastrous Radio 1 Roadshow where aged equipment proved to be incompatible with modern generators and Gregory had to tap-dance the whole set, and went. Then an argument with Spirit of '86 meant that The Most Beautiful was withdrawn, and things looked decidedly uncertain. 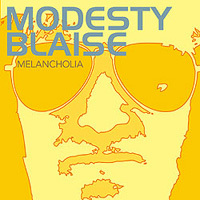 Modesty Blaise then settled on a line-up for long enough to record the award-winning apricot album Melancholia which featured in many end of year polls as one of the finest albums of 2000. A magnum opus that encompasses many genres, the album's centrepiece, Carol Mountain was released as a single and was hailed as the finest single of the year. and at Arlene's Grocery in New York. 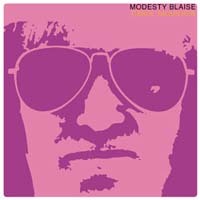 The band are currently recording their long overdue third album proper, Modesty Blaise. 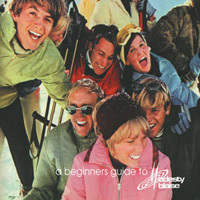 60s, brilliant movie, stylish, great suits and haircuts, cabriolets with leatherseats, coming home to airports from some days spent at the Riviera...This guide will teach you how to live your life the Modesty Blaise way: live in idleness, live high, live on charity or live on hope - there will be always POP-moments in your life. And here is the soundtrack to fill your life with style. everyone is raving about this new science-fiction movie called "uranium girl". and then you get blown away because she is appearing on the screen. dressed in a tight and glittery suit with the most stylish boots you could imagine and with the cutest haircut ever. she is the uranium girl and she is not from this planet - that is for sure. The magic of exchanging the warm home with a hot club, of drinking mojito instead of tea, of dancing and jumping around instead of walking the dog - i'm going out captures the beauty of a night in a bar after a exhausting week of work. i'm going out is taken from the new album by modesty blaise called melancholia, jonny collins' answer to brian wilson's pet sounds and sean o`hagan's hawai. the two other tracks are exclusive to this 7''. get this single, hand it out to the dj in your favourite club on a friday night and dance to modesty blaise with your friends - the week- end is about to begin! You probably have to suffer a bit from melancholia when you are a popstar living in Bristol, a city well known for its vivid trip hop scene. Jonny Collins, the face behjind the exciting band Modesty Blaise is a popstar indeed a he is living in Bristol. But the only thing related to Melancholia you will hear from him is the title of his new album. Jonny is not a guy with dark thoughts, he is more into things like fur-coats, Diana Ross haircuts and football from the 70s. 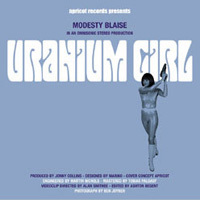 However, the songs by Modesty Blaise will remind you of tunes that you have not heard since the 60s. Don't be afraid of the dark side of life and listen to Melancholia and the warmth of music! caroline no by the beach boys is one of the most beautiful love-songs ever written. brian wilson put all his passion in it and it was the central part of the album pet sounds. modesty blaise's very own jonny collins shares the same dedication for music and last years album melancholia is an excellent record in the vein of classic beach boys harmonies, an album that could not be be imagined without pet sounds or sgt pepper by the beatles; instrumentation and arrangements inspired by van dyke parks, full of complexity but always being P!O!P!-music in it's classic meaning. "i do not know what constitutes hits these days but that must be close to being one" said mike alway founder of él-records when he heard melancholia. with carol mountain the most ambitious track is now released as a single. the tune that the british music-magazine record collector called "full-on summer P!O!P! fun" was recorded with a whole armada of musicians. this song demonstrates jonny's obsession with perfection and P!O!P! uprightness. carol mountain comes with two unrelesead tracks in a limited edition of pink coloured vinyl.